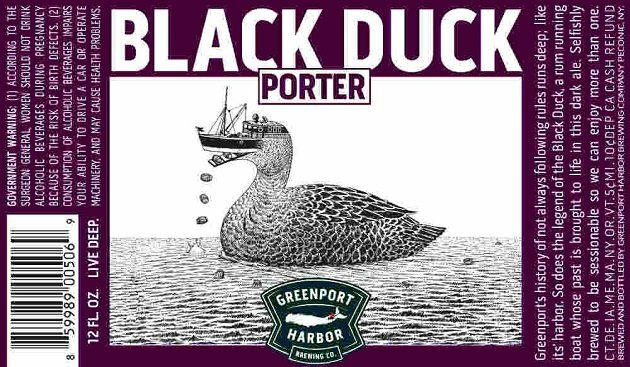 Having grown up in Suffolk County on Long Island, New York, I made the reasonable assumption that the Black Duck Porter made by Greenport Harbor Brewing Company was named for the American Black Duck, a locally common dabbler found throughout the East End’s many bays and saltmarshes. With its appropriately birding name and label, I thought this beer would make an ideal subject for my inaugural post here on the new 10,000 Birds “Birds and Booze” beat. I’ve enjoyed this beer several times over the years, but had always written off the bottle label designed by East Hampton artist Scott Bluedorn – which depicts a giant duck with a boat for a head, dropping barrels from its bill into a calm sea below – as mere artistic whimsy. 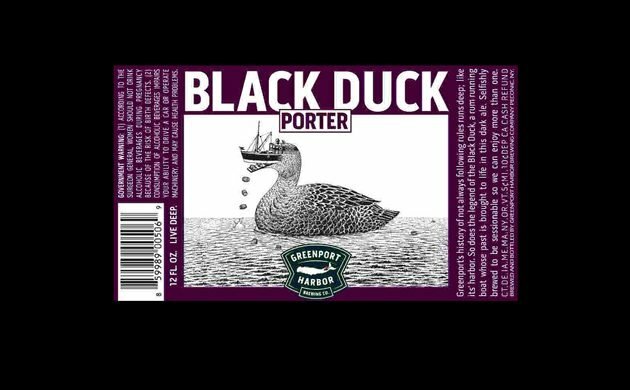 But as it turns out, Bluedorn’s farfetched illustration is not simply a casual recognition of the local North Fork waterfowl, or even of Greenport’s longstanding nautical traditions, but rather commemorates the surprising backstory of this excellent porter’s little-known namesake. The actual Black Duck for which this porter was named wasn’t a bird at all, but a boat – an infamous Prohibition-era rum-runner that sped across the waters off southern New England in the 1920s, ferrying cases of “demon rum” between New England and New York during America’s thirteen-year experiment in legislatively imposed temperance. The speedy 50-foot motorboat gained a reputation outpacing Coast Guard patrol boats on many occasions, allowing its crew – as I like to imagine – a little breathing room to take in some seabirding on the Block Island Sound. Or at least enough time for a quick tipple. But the Duck’s luck finally ran out on December 29, 1929. A Coast Guard gunboat encountered the bootlegger in Narragansett Bay, and when the Black Duck refused to heave to, the feds opened fire, allegedly without warning. Three of the four smugglers aboard the Black Duck were killed. Following this incident, the swift Black Duck was requisitioned by the Coast Guard and let loose in the very same waters to chase down other rum-runners, with great success. But the controversy of the ugly and violent Black Duck incident helped turn the tide of public opinion against Prohibition, leading to its repeal in 1933 (and a good thing too, or else you wouldn’t be reading a beer review on a birding blog right now). I haven’t been able to find any accounts of what illicit drink the Black Duck was hauling that fateful night, but it almost certainly was not porter. Porter was an immensely popular beer in the eighteenth-century English-speaking world, and it was certainly the first beer the British – or anyone else – learned to produce, ship, and market in truly imperial quantities – the first Industrial Age beer. But for all its historical importance, porter suffered a precipitous decline in popularity in the twentieth century on both sides of the Atlantic, and it vanished completely from its British Isles homeland when Guinness ceased porter production in 1974. Luckily, the style was already undergoing an earnest revitalization by American craft brewers, led most notably by Anchor Brewing of San Francisco. Thanks to these efforts, porter is once again a popular and familiar style, and I think this version by Greenport Harbor Brewing Company is a particularly worth offering. 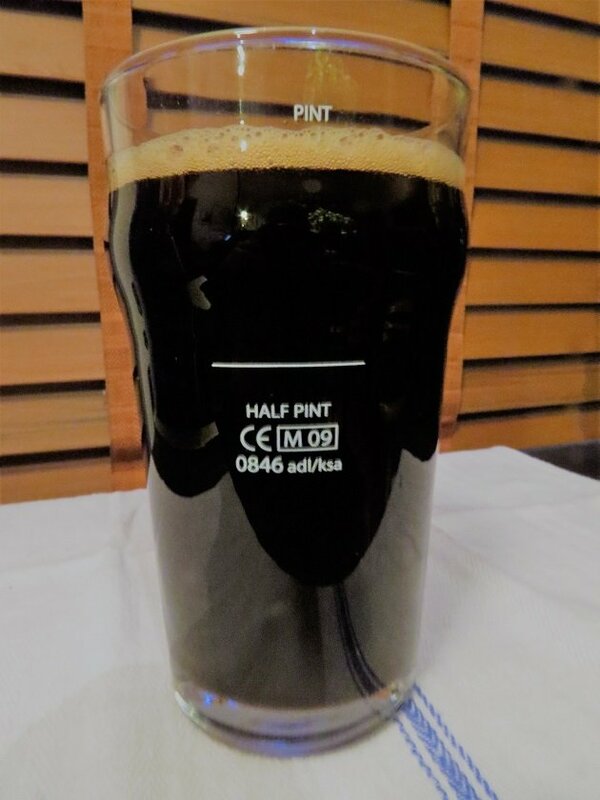 Like the bootlegging Black Duck, porter is a tricky thing to pin down, generally residing somewhere between brown ales and stouts, with enough overlap between them to inspire the most heated arguments among brewers and drinkers (brewers might argue over identification even more than birders do). Stylistic quibbles aside, Greenport’s version lands firmly in the English-inspired porter camp: a dark ale in which the hops take a backseat to the surprisingly complex palette of flavors a skilled brewer can coax from roasted grain. Black Duck Porter lives up to its name in the glass, making for an impenetrably dark, near-black pour, topped with a thick and rocky tan head. The beer reveals a noticeable rubescent tint when held to the light – perhaps the brewery intended these ruddy highlights as a nod to Anas rubripes? Probably not. However, as a porter, it goes without saying that this Black Duck is going to be roasted; bittersweet chocolate and dark coffee aromas predominate in the nose, with an underlying fruitiness that hints at dates and figs. As in many porters modeled on English archetypes, the scent of hops is muted here, perhaps contributing a faint earthiness. Roasted flavors continue with each sip, backed by loads of bready malt, spicy and medicinal touches redolent of molasses, along with more ambiguous, enticing hints of dried fruit and cherry cordial, with just enough hops to keep it all in check. The finish is satisfyingly dry, with a lingering bitterness that owes just as much to roasted malts as it does to hops, with a faint, sooty smokiness at the end. It’s an old canard among some drinkers that dark beers are higher in alcohol, or thick and cloying, but the Black Duck is a relative middleweight, weighing in at 4.7% alcohol by volume, and making for a crisp, drinkable pint – or two – at any time of the year. 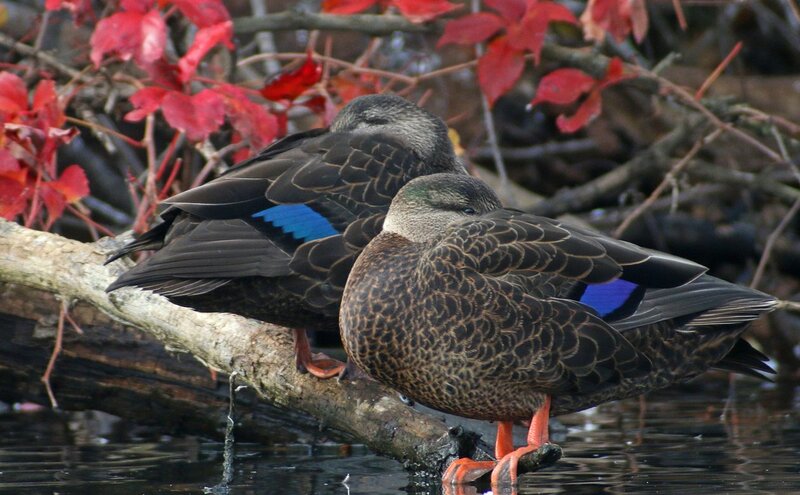 Like any porter, Black Duck is an especially fitting pairing for roasted and smoked foods, barbecue, and chocolate and coffee desserts, or just good early autumn drinking – just about the time of year you might start seeing an uptick in American Black Ducks in your area. I shall try some next time I am your way. Where Are You Birding This Second Weekend of September 2017?